We all know Jobu is a Yankees fan. It is going to pain me to write every word that makes up this post, but I think Jacoby Ellsbury is the 2011 American League MVP. If there was any doubt about that fact, Jacoby removed it this weekend with his performances against the Yankees in a must-win series for the Red Sox. None of the Sox showed up in game 1 on Saturday, so we’ll skip that. Game two was more of the Sox not showing up, but this time Ellsbury did. The Red Sox managed six hits the whole game, even though A.J. Burnett and his 5.16 ERA were on the mound. Ellsbury had three of those hits, including two solo home runs. The rest of the Red Sox managed only two singles and a double, and no runs. Ellsbury was practically on his hands and knees begging the rest of his teammates to do something, anything to help the Sox not blow their wild card lead. In the night cap, the Red Sox actually made a game of it with the Yankees. A loss would have meant a wild card tie with the Tampa Bay Rays with three games to go. After trailing 3-0 in the first inning, the Sox came all the way back to take a 4-3 lead before the Yankees tied it up at 4 in the bottom of the seventh inning. The score stayed that way until the top of the 14th inning, when the Yankees gave up and put in Scott Proctor. Proctor gave up a single and a walk, before Ellsbury came to the plate. Proctor threw a 1-0 fastball right down the middle, and Ellsbury absolutely crushed it. The ball went into the right-center field bleachers to give the Sox a 7-4 lead, and an eventual win. In a season of clutch hits, Jacoby Ellsbury notched the team’s biggest of the year. He may have single-handedly saved the season for the Red Sox faithful. His performance in the clutch has been well documented this season. He had walk-off hits in two consecutive games against the Indians in August (a single and a home run, respectively), but that doesn’t necessarily make an MVP. A true MVP comes through all year round, and especially in the clutch, and that’s what Ellsbury has been doing. Ellsbury’s numbers are pretty astounding overall. He’s hitting .322, which is good for 5th in the league. He’s also in the top five in runs with 117 (3rd), hits with 208 (3rd), doubles with 45 (4th), SB with 38 (4th) and the top ten in HR with 31 (8th), RBI with 103 (7th), OPS with .930 (6th) and SLG with .551 (6th). For those of you who aren’t down with traditional statistics, Ellsbury is also first in the majors by a large margin in fWAR (Wins Above Replacement according to Fangraphs.com) with 9.2. What does this mean? It means that Ellsbury was replaced with with an average player, the Red Sox would have 9.2 less wins than they currently do. That would put the Red Sox at 79-80 right now, nine games back of the Rays in the Wild Card race (not to mention 18 games behind the Yankees in the division). His defensive metrics are off the charts too, as his defense has saved 14 runs this season alone according to UZR metrics. Basically, he saves runs on defense and provides key runs on offense at an advanced pace, and that’s what an MVP should do. Granderson presents the biggest threat to Ellsbury’s MVP. The other candidates are having great seasons, but I don’t think they mean as much to their teams as Ellsbury has meant to the Red Sox. Justin Verlander is having one of the best seasons by a pitcher that we have seen in a long time. He leads the league in starts (34), Innings (251), wins (24), ERA (2.40), WHIP (0.920), and strike outs (250). That’s all fine and dandy, but pitchers shouldn’t win MVP. They have their own award, and it is the Cy Young. Verlander should walk away with that hands down, but get out of my MVP race. Ellsbury’s teammate Adrián González is having a great season in his own right. He’s hitting .338 (2nd in the league) and with 210 hits (1st). He’s also knocked 27 home runs and driven in 117 runs (2nd). He has, however, hit .183 against the Yankees, which is not going to make him MVP. Ellsbury on the other hand, is hitting .375 against Boston’s biggest rival with 6 HR and 20 RBI. MVPs come up huge when the lights are their brightest. Jose Bautista is having an amazing season too. He is, once again, leading the league in Home Runs with 43, and also leads in OBP (.447), SLG (.615), OPS (1.062) and walks (128). He is also hitting over .300, which puts an end to the talk about him being a one dimensional power hitter. Unfortunately, the Blue Jays are out of the playoff hunt, and have been for months. Unless he hits .400, or breaks the home run record, a player on a losing team should not be MVP. This brings us to the Yankees candidates, whom I think have the best chance to beat Ellsbury in this Race. First is center fielder Curtis Granderson. After an iffy first season in pinstripes, Granderson is having the best season of his career in 2011. Grandy is only hitting .266, but that’s in line with his career number (.268), so that is what it is. Batting second on the New York Yankees has its perks, and scoring runs is one of them. 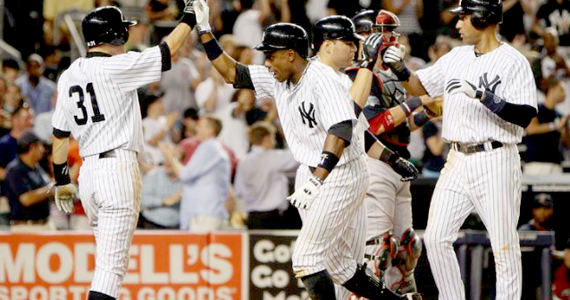 Granderson leads the league with 135 runs (17 more than Ellsbury, who is 2nd). He leads the league in runs batted in with 119 and is second in Homers with 41. He has also stolen 24 bases this season to boot. 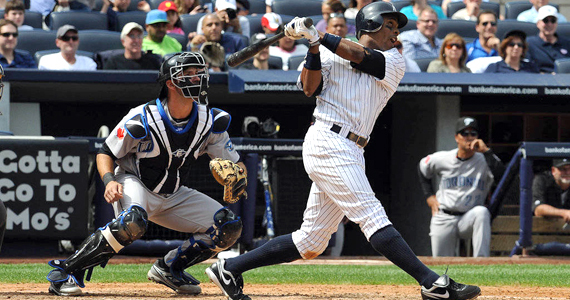 Granderson has helped get the Yankees through some tough times in 2011. A-Rod has been limited to 97 games this year, and Jeter also missed some time with injury. Teixeira is only hitting .244 (although he has 37 HR and 106 RBI), so this team has really needed Granderson this year, and he has stepped up huge. The 135 runs, 119 RBI and 41 HR definitely stand out to voters, especially when the player plays in such a large market like New York or Boston. He also plays excellent every-day defense (despite what the metrics say about him). The other candidate from New York is second baseman Robinson Canó. Canó is having just another Robinson Canó kind of year. He’s hitting .304 with 80 extra-base hits (46 2B, 7 3B, 27 HR), and has 103 runs scored and 116 runs batted in. Robinson has continued the defensive prowess that won him a gold glove in 2010 too, which should boost his stock as well. Unfortunately for Robinson, he has been out shined a bit by Granderson this season. That, and the fact that Canó’s season totals are in line with (if not slightly lower than) his totals for the last two seasons, will keep Robinson from winning the MVP this year. So… there you have it folks… As much as i hated writing this post, I had to be honest with myself and my readers. Jacoby Ellsbury saved the Red Sox season yesterday, assuming they don’t completely blow it against Baltimore the next three days (I will be rooting for that vehemently). He has been, and should be, the American League MVP. I will now light myself on fire (and steal a line from Bill Simmons).